When you major in history in college, you feel at home in an historic building! 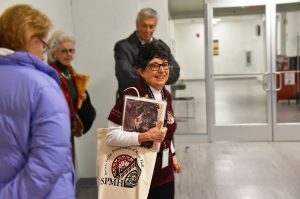 Barbara Gomes is in her third year of sharing her knowledge of Music Hall’s history and architecture as an SPMH volunteer. She wears many hats, including that of Program Guide, Content Curator, trainer, writer and editor. Several of the presentations in the Speakers Series feature Barbara’s research skills and exemplify her attention to detail. Barbara’s love of history, and of classical music, brought her to SPMH. I enjoy sharing what we have here. I believe that there are so many opportunities in this city to participate in cultural activities, many of which focus on Music Hall and its neighbors in Over-the-Rhine. Classical music is one of her passions. Barbara was one of the original organizers of the Linton Chamber Music series. When she’s not at Music Hall attending concerts or leading tours, Barbara can be found singing in area choirs. She and her husband are members of the MLK Chorale, the Classical Roots community Chorus, the May Festival Community Chorus, and their church choir. Her husband, Ron Hoffman, is also a SPMH volunteer. If those activities don’t fill her schedule, Barbara knits and crochets lap blankets for patients at St. Elizabeth Hospice.